busted is a unit testing framework with a focus on being easy to use. busted works with lua >= 5.1, moonscript, terra, and LuaJIT >= 2.0.0. -- or check by reference! Install busted through Luarocks. Depending on your environment, you can apt-get install luarocks, brew install luarocks, or otherwise get it from luarocks.org. You can also install the latest or a branch by cloning the busted repository, and running luarocks make from the directory. split into multiple options at the commas. This allows you to run busted --run=apiUnit, which will run the equivalent of busted --coverage --tags=api --verbose spec/unit. If you only run busted, it will run the equivalent of busted --coverage --verbose. You can also run busted tests standalone without invoking the busted executor. By adding require 'busted.runner'() to the beginning of your test file, it becomes a standalone executable test. This runs the test as a standalone Lua script. Of course you can still run the test using busted explicitly. Additionally, you can still use all of the same busted command-line options when running in standalone mode. Set up your tests using describe and it blocks. These take a description (to be used for output) and a callback (which either defines more blocks or contains the tests themselves. Describe blocks can have more decribe blocks nested. You can also use the functions before_each and after_each to define functions that should be run before any nested tests, and setup and teardown for functions that should be run before and after the describe block. You can also use the pending method to leave a placeholder for a test you plan on writing later. Tag your tests with #hashtags to run specific tests. When you run busted from the command line, add the -t flag to run a given tag. Seperate tags by commas to run more than one tag. describe takes a title and a callback, and can be nested. You can also use context as an alias if you like. insulate and expose blocks are describe aliases that control the level of sandboxing performed by busted for that context block. Like their names suggest, an insulate block insulates the test environment, while an expose block exposes the test environment to outer context blocks. By default each test file runs in a separate insulate block, which can be disabled with the --no-auto-insulate flag. Test environment insulation saves the global table _G and any currently loaded packages package.loaded, restoring them to their original state at the completion of the insulate block. Exposing a test environment exports any changes made to _G and package.loaded to subsequent context blocks. In addition, any global variables created inside an expose block are created in the environment of the context block 2 levels out. Using expose at the root of a file will promote any require's and globals to the root environment, which will spillover into subsequent test files. Tag tests using #tags, and run using the -t flag to only run that test. This runs the first group of tests, but not the second. You can also exclude tests that use tags with the --exclude-tags flag. This can be useful, for example, if tests using a certain tag take a long time to run and you want busted to skip them. This would run all tests except the second group in the example above. If you use -t, --tags and --exclude-tags together then --exclude-tags always takes precedence. Both tags refer to the same test but busted will not run it since --exclude-tags takes precedence. It is ok for different tags to refer to the same tests, but using the exact same tag name with --tags and --exclude-tags at the same time is an error. You can cause nested tests and describes to be randomized by calling randomize(). If randomization has been enabled for all tests with the --shuffle flag, you can turn off randomization for nested tests and describes by calling randomize(false). An it block takes a title and a callback. Tests fail if an uncaptured error is thrown (assert functions throw errors for failed tests). You can also use spec or test as aliases if you like. before_each runs before each child test, and after_each (you guessed it) runs after. setup runs first in a describe block, and teardown runs last in a describe block. setup and teardown blocks can be made lazy or strict. lazy_setup and lazy_teardown will only run if there is at least one child test present in the current or any nested describe blocks. Conversely, strict_setup and strict_teardown will always run in a describe block, even if no child tests are present. By default setup and teardown are strict, but can be made lazy with the --lazy flag. -- both, starting with the parents'. You can go n-deep. finally is also available as a lighter alternative that avoids setting upvalues. Pending functions are placeholders for tests you plan to write (or fix) later. Asserts are the core of busted; they're what you use to actually write your tests. Asserts in busted work by chaining a modifier value by using is or is_not, followed by the assert you wish to use. It's easy to extend busted and add your own asserts by building an assert with a commmon signature and registering it. Busted uses the luassert library to provide the assertions. Note that some of the assertion/modifiers are Lua keywords ( true, false, nil, function, and not) and they cannot be used using '.' chaining because that results in compilation errors. Instead chain using '_' (underscore) or use one or more capitals in the reserved word, whatever your coding style prefers. is and is_not flips the expected value of the assertion; if is_not is used, the assertion fails if it doesn't throw an error. are, are_not, has_no, was, and, was_not are aliased as well to appease your grammar sensibilities. is and its aliases are always optional. Equals takes 1-n arguments and checks if they are the same instance. This is equivalent to calling object1 == object2. Same takes 1-n arguments and checks if they are they are similar by doing a deep compare. true evaluates if the value is the boolean true; truthy checks if it's non-false and non-nil (as if you passed it into a boolean expression in Lua. false and falsy are the opposite; false checks for the boolean false, falsy checks for false or nil. Makes sure an error exception is fired that you expect. Spies are essentially wrappers around functions that keep track of data about how the function was called, and by default calls the function. Stubs are the same as spies, except they return immediately without calling the function. mock(table, stub) returns a table whose functions have been wrapped in spies or stubs. Spies contain two methods: on and new. spy.on(table, method_name) does an in-place replacement of a table's method, and when the original method is called, it registers what it was called with and then calls the original function. Stubs act similarly to spies, except they do not call the function they replace. This is useful for testing things like data layers. 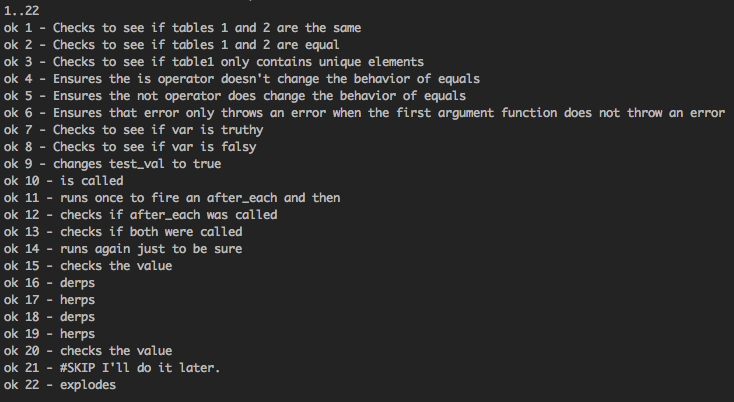 Mocks are tables whose functions have been wrapped in spies, or optionally stubs. This is useful for checking execution chains. Wrapping is recursive, so wrapping functions in sub-tables as well. Matchers are used to provide flexible argument matching for called_with and returned_with asserts. Just like with asserts, you can chain a modifier value using is or is_not, followed by the matcher you wish to use. Extending busted with your own matchers is done similar to asserts as well; just build a matcher with a common signature and register it. Furthermore, matchers can be combined using composite matchers. Combine matchers using composite matchers. Add in your own matchers to reuse commonly written code. Sometimes you need to write tests that work with asynchronous calls such as when dealing with HTTP requests, threads, or database calls. Call async() at the top of an it to specify that your test should wait, and call done() to complete a test. Busted supports several output handlers by default, and it's easy to extend busted to include your own output handlers. Uses ansicolors and utf to display a concise but informative output. Uses safe characters and no coloring. Useful for streaming or loading all results at once with the --defer-print flag. TAP is an agnostic protocol used by most automated testing suites. Moonscript is a dynamic scripting language that compiles to Lua. Busted supports Moonscript natively without any additional compilation steps, and will redirect line numbers to show the proper line numbers for failing tests. Busted supports English (en), Arabic (ar), French (fr), Spanish (es), Dutch (nl), Russian (ru), German (de), Japanese (ja), Chinese (zh), Thai (th), and Ukranian (ua) by default. Check out the existing language packs and send in a pull request. Busted supports adding in new languages easily. Pass a --lang parameter to choose one of the built-in languages, or a path to a lua file to run containing your own language. Don't forget to submit languages in pull requests as you make them! Check out the existing language packs to see a template for what you should replace. Copy any of the existing files. It uses the say string key/value store for registration. You can download shell completion packs from the ./completions folder of the Github repository. You can help! It's as easy as submitting a suggestion or issue, or check out the code for yourself and submit your changes in a pull request. We could especially use help with translations - check out the src/languages folder in busted and luassert to see if you can help. busted has a big list of contributors and we welcome contributions from all! busted is bravely maintained by Olivine Labs. MIT Licensed. © 2013 Olivine Labs, LLC. Documentation hosted on GitHub Pages.